There are just some recipes that knock my socks off. They are unique. They are different. They are unlike anything I have ever tasted before. 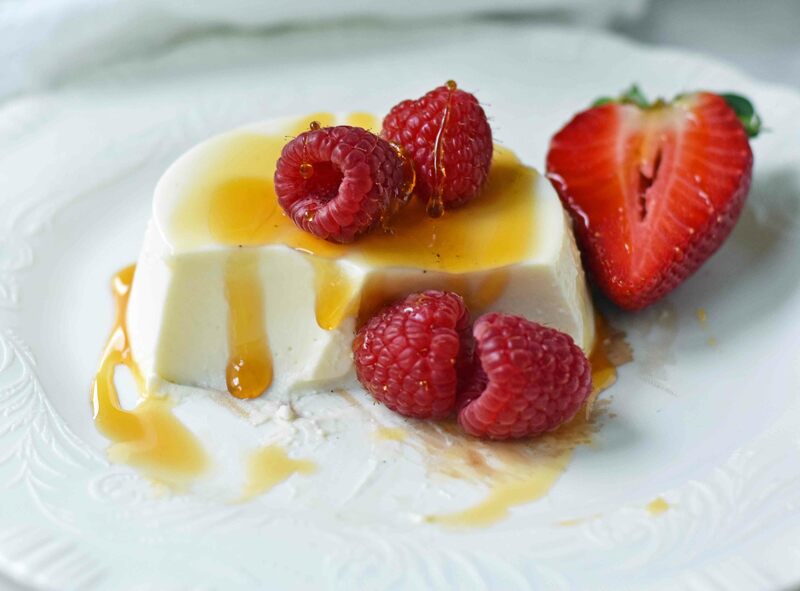 This Greek Yogurt Panna Cotta is one of those recipes. I once had this same reaction when I first tried Jeff’s Best Banana Cake and I had it again with this creamy Panna Cotta recipe. It is that amazing. Let’s be honest. 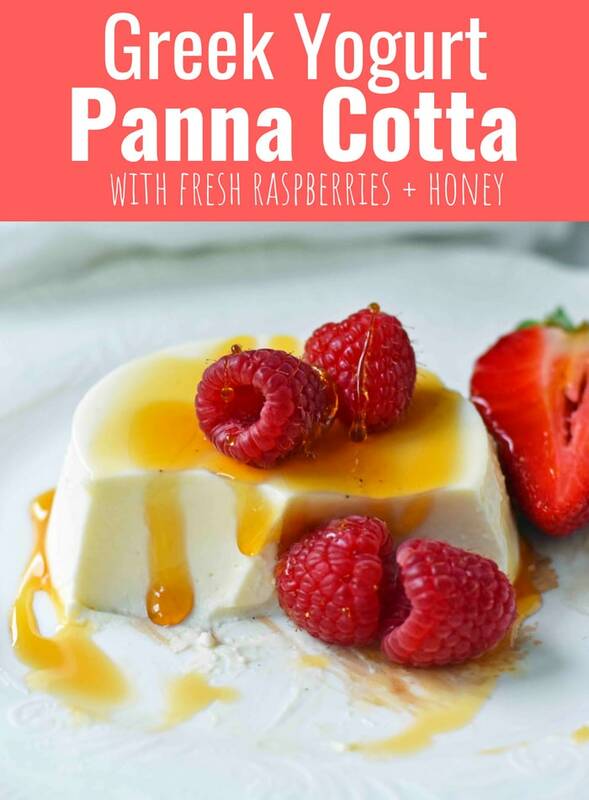 I have never made Panna Cotta…but have always wanted to. I have eaten it many times and have always wanted to recreate it in my home. 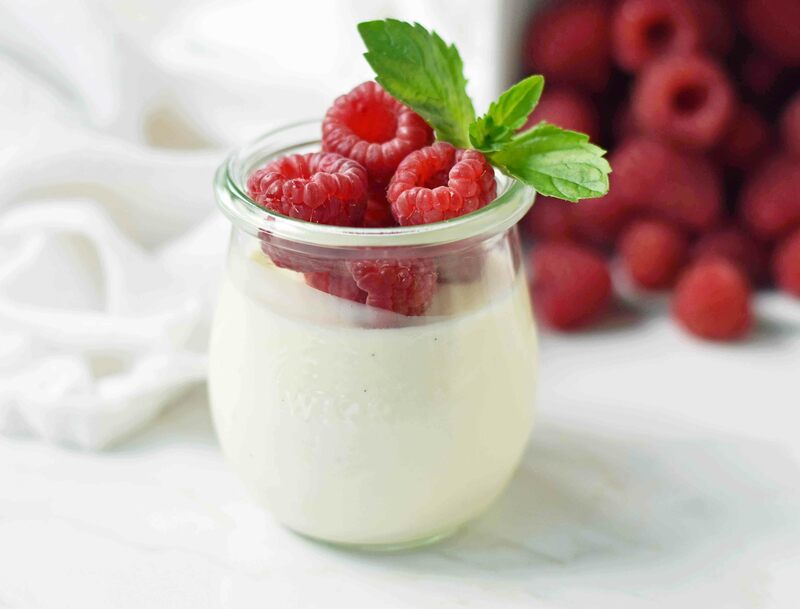 Some people may say, “what is panna cotta?” It is a chilled, creamy Italian custard, thickened with gelatin. It is creamy, silky smooth, and just melts in your mouth. After I created this recipe and taste tested it, my mouth dropped to the floor after my first bite. I beckoned my Mom and husband to come try it and they had the exact same reaction. Before I knew it, they were begging for more bites. 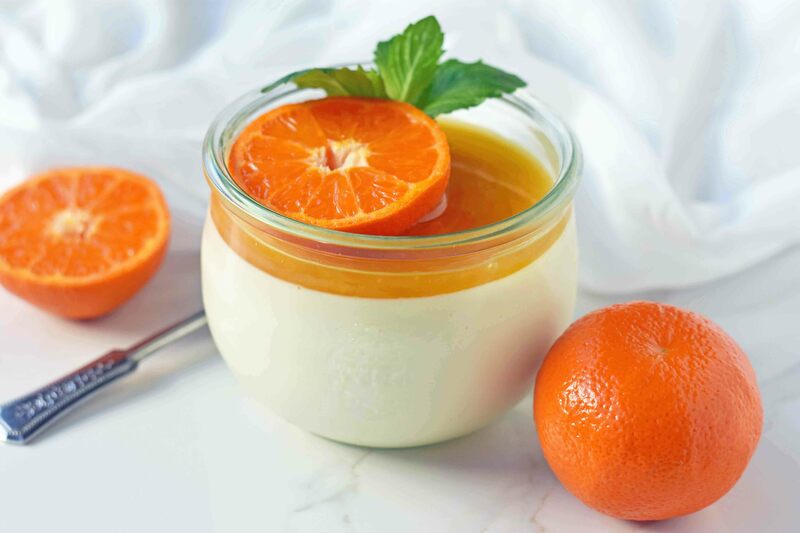 This Panna Cotta is unique because it is made with both Greek Yogurt and Heavy Cream. 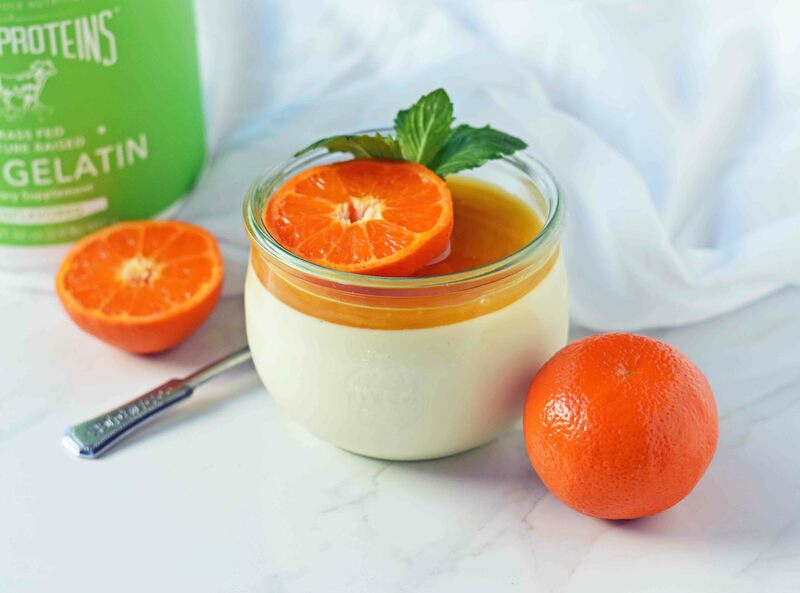 The greek yogurt adds a bit of tang while adding a rich creamy texture along with the added benefits of protein. 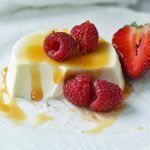 I always use plain greek yogurt as there are no additives and is the perfect base for this yogurt panna cotta recipe. My Mom, who is a wonderful cook, recently came over to help me create recipes for Modern Honey. I love having her in the kitchen because I can bounce ideas off of her and we can experiment together. Since this was the first time making panna cotta, we decided to experiment. I first tried making it using an equal ratio of greek yogurt to heavy cream. After we added all of the ingredients together, we decided it needed to be a tad sweeter. Instead of dumping in more sugar, we opted for a more natural source — honey. It added just the right amount of sweetness and it was perfect. If you prefer sugar, you may substitute sugar for the honey. I decided that since the Greek yogurt flavor is quite noticeable (which is quite lovely and delectable), I wanted to see what it would taste like with a 2 to 1 ratio of heavy cream to greek yogurt. I wasn’t sure how it would set up and if it would affect the texture. After several hours of waiting for the panna cotta to chill and set up, the results were in. It was pure silk. It was creamy. It was silky smooth. None of us could stop eating it. How does Panna Cotta set up? When you first make this dessert, it will be thin and runny and you may wonder how in the world it will firm up just by chilling it. 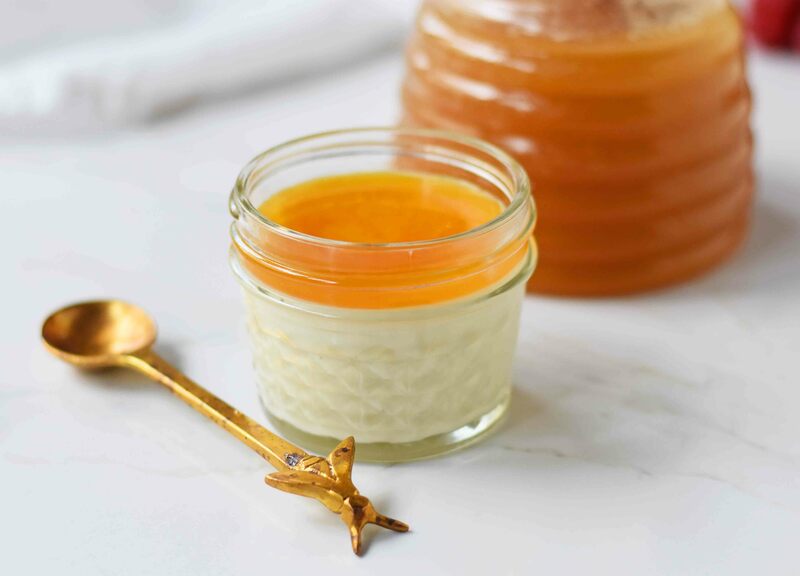 There’s a magical ingredient that completely transforms the panna cotta — gelatin. I only like to use high-quality gelatin with rich sources of collagen. We have all heard how good collagen is for our skin, hair, bones, and joints. I just gave you another reason to eat this dessert! 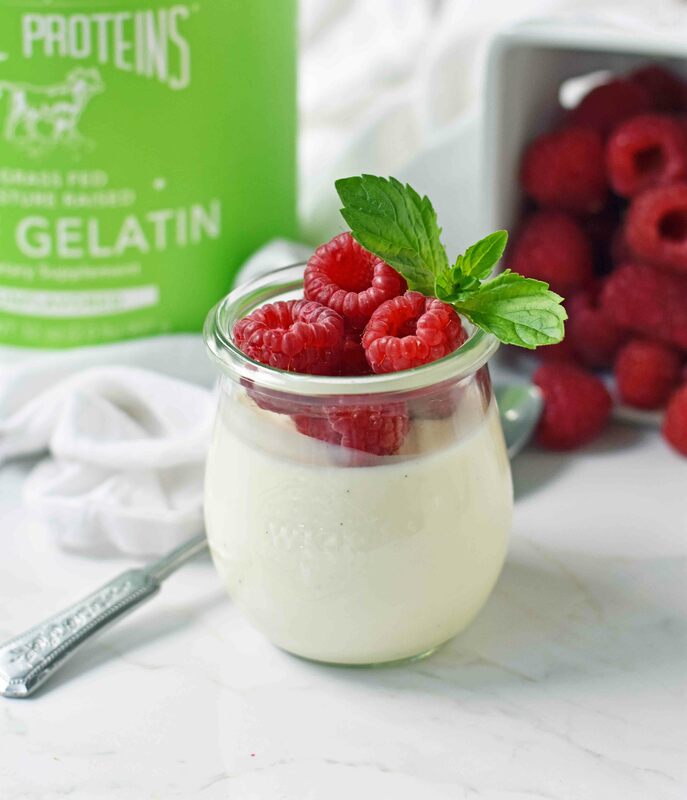 I love Vital Proteins Gelatin as it has 20 grams of natural collagen per serving. I save my vanilla beans for special desserts such as custards and frostings when the vanilla flavor really comes through. This is one of those times to break out the vanilla bean, if you have them in your baking pantry. Remember to always add your vanilla after you take the panna cotta off of the heat for full flavor benefits. 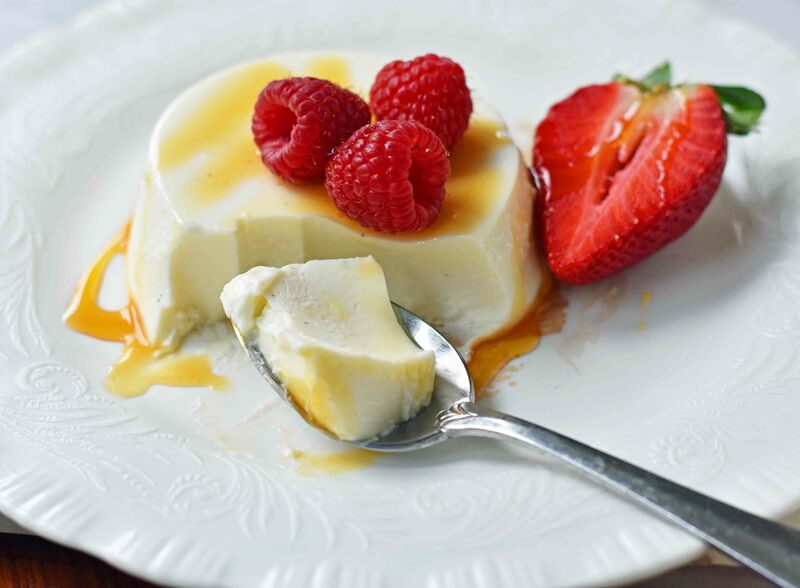 What are some Panna Cotta topping ideas? The beauty of this simple dessert is that you can change it up every single time. Top it with a drizzle of orange blossom honey, salted caramel, fresh berries, honey walnut drizzle, berry compote or sauce, and so many more. So I am including both recipes so you get to choose! I think they are both wonderful and you can’t go wrong. If you use the equal ratio of cream to yogurt, you can even serve this at breakfast. It would be so beautiful at a breakfast buffet bar with fresh berries, granola, and honey. Your guests will be so impressed! Yay for serving easy panna cotta for breakfast! Start by heating heavy cream, sugar, and honey over medium heat. This is an important step as it helps dissolve the sugar to ensure the panna cotta is completely smooth. Just cook until barely simmering and remove from heat. Do not bring to a boil. Remove from heat and stir in gelatin. What does gelatin do? It is a thickening agent and works wonder to solidify this dessert. The gelatin will dissolve within seconds so keep whisking. I used my favorite Vital Proteins Gelatin in this recipe. You can find it HERE. In a small bowl, mix remaining heavy cream and greek yogurt until smooth. Add warmed cream and sugar to yogurt mixture and stir together. Add vanilla beans or vanilla extract. Pour into jars, glasses, ramekins, custard dishes, or whatever you prefer. You may serve panna cotta in glasses or may invert it onto a plate. Top with honey, fresh fruits, nuts, caramel, homemade jam, or whatever you desire. 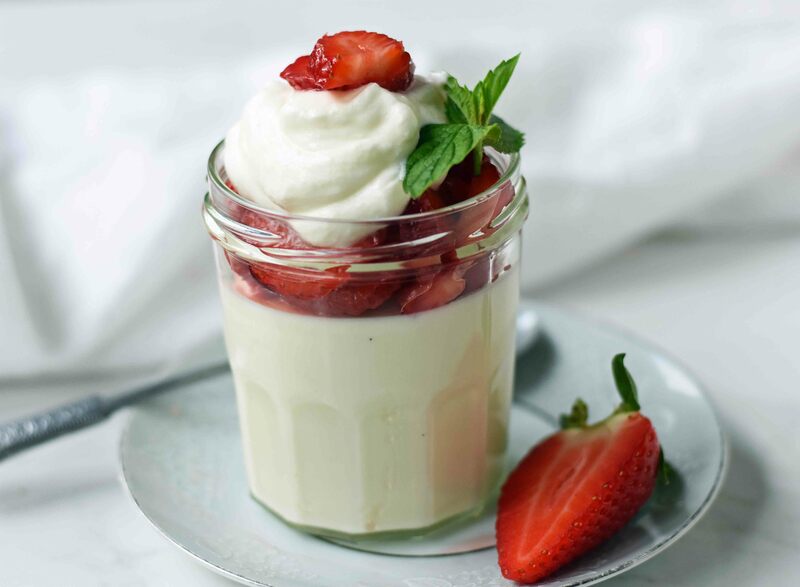 An easy panna cotta recipe with greek yogurt, sugar, honey, gelatin, and vanilla bean. A creamy, silky smooth dessert. Place gelatin in small bowl and sprinkle water over gelatin. Stir and set aside. In a medium saucepan, heat 1 cup of heavy cream, sugar, and honey over medium heat until it begins to simmer and sugar is dissolved. Do not let it come to a boil. Remove from heat and stir in gelatin mixture. Whisk until gelatin dissolves. Meanwhile, in a small bowl, stir together Greek yogurt and remaining 1 cup of heavy cream. Stir yogurt mixture and heated cream sugar together until creamy. Add vanilla beans or vanilla extract and stir. Pour into jars, glasses, ramekins, or dishes. Place in refrigerator, covered, for 4-5 hours, or until set. You may serve panna cotta in glasses or may invert it onto a plate. To invert on a plate, run a sharp knife along edges to release. If the panna cotta isn't coming out, carefully place ramekin in hot water and it will slide right out. 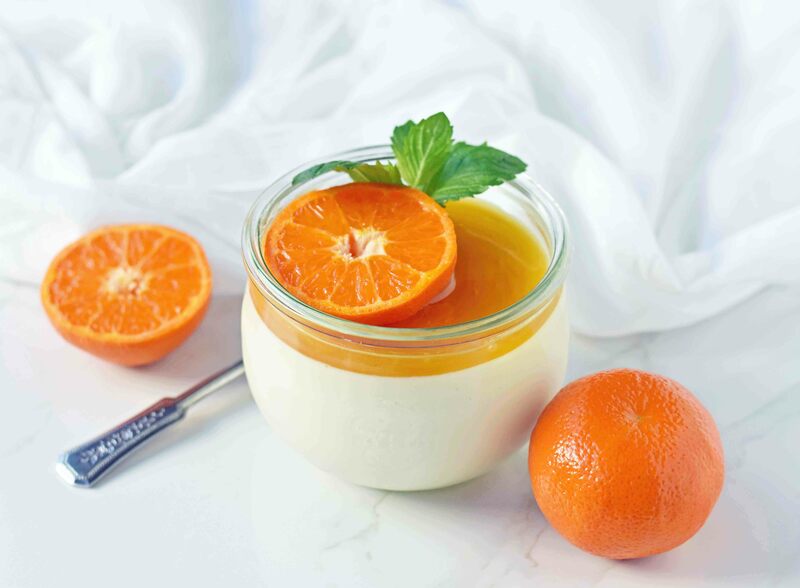 I hope you love this easy Panna Cotta recipe! This is going down as one of my most favorite simple desserts of all time. Happy Baking, my friends! I see you can add vanilla extract, what about almond extract? I’m a HUGE almond flavor fan and would love to experiment with that a bit. Would that alter it too much? This looks delicious. Such a beautiful, creamy texture!